This EKG is important for emergency medicine providers. It is commonly seen in presentations of chest pain, and it is one of the most difficult of EKG patterns for ED physicians to interpret definitively. 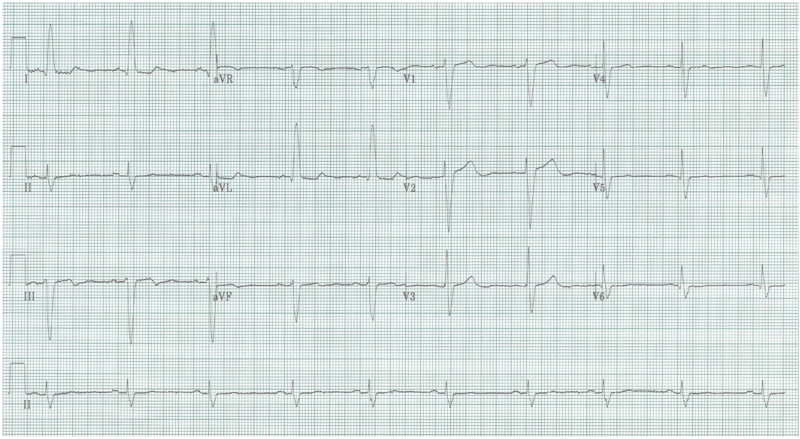 While ST-segment elevation in the anterior leads may be the most concerning feature of this EKG on a cursory evaluation, there may be an alternative, and more appropriate, explanation. As LVH becomes more severe, the changes on the EKG begin to resemble those of LBBB. Notice, however, that normal small Q waves (“septal Q waves”) remain in the lateral leads (I, aVL, V5-6). These Q waves signify that the LBBB is still functioning and provides depolarization of the septum! Sometimes it takes some skill and confidence to NOT call a consultant!